If your nail polish collection puts your shoe stack to shame then you might wanna put down your cuticle stick and let your lacquer dry for a few minutes because this trend edit could come in rather handy. 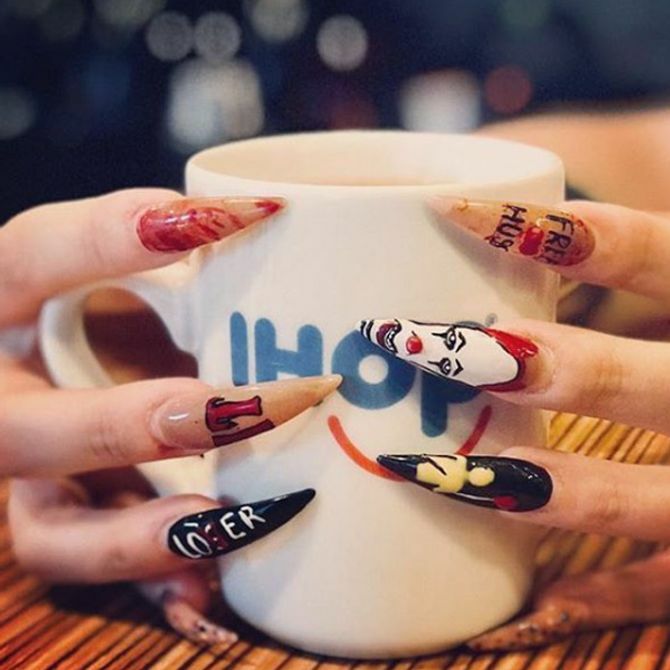 From the hottest new shades to 3D add ons and half moon digit designs, 2017 really has bee the year nail art. Here's the wackiest of the lot. Painting polka dots on your top coat just for fun? Getting stained fingertips from the hours spent DIY-ing your digits with this season's hottest hue? That's standard behaviour for a girl with a weakness for nail art, right? Chances are you've already buffed, smoothed and filed your nails into shape in a post-party pampering session but it's never too late to try out some of this year's runway-approved nail looks. From glitter-dipped tips and snow-coloured cuticles, the statement mani is 2017's hottest accessory so whatever the occasion don't keep your hands in your pockets, show them off, reach for your midi rings and if all else fails, resort to the jazz hand. You don't have to be an all-out diamante addict to enjoy these designs, there's subtle sheen effects and matte manis aplenty for you to put to the test. Whether you're new to the nail-art loving scene, eager to use those nail wraps you got in your stocking this Christmas or just looking to kick your talons into touch for 2017, we've got all the inspiration a girl could ever wish for. 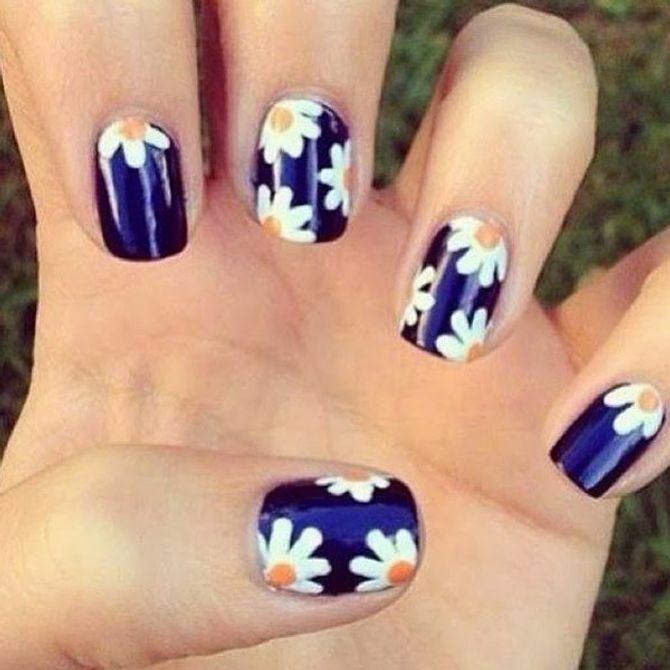 Here's the nail art trends we've been obsessed with this year! 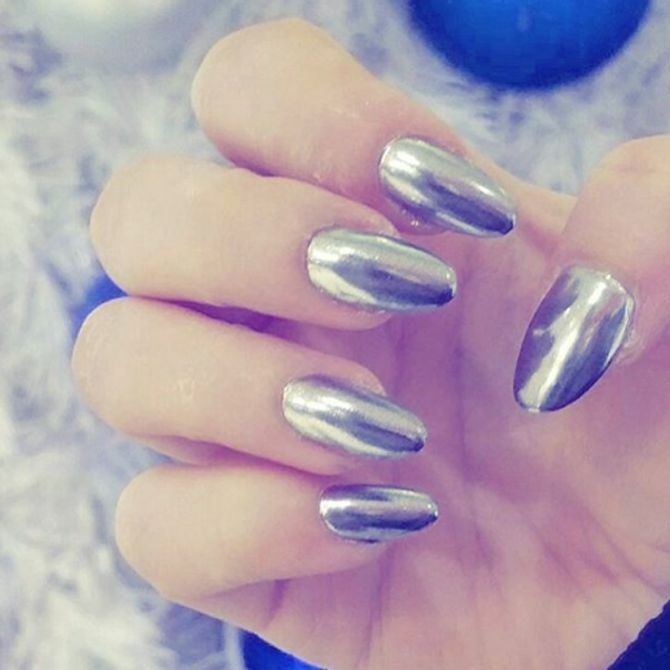 If mirror manis haven't cluttered your Instagram feed yet, they certainly will come 2017. The options are endless when it comes to these metallic shades - go silver for a standard everyday or rose gold for maximum Instagram likes. 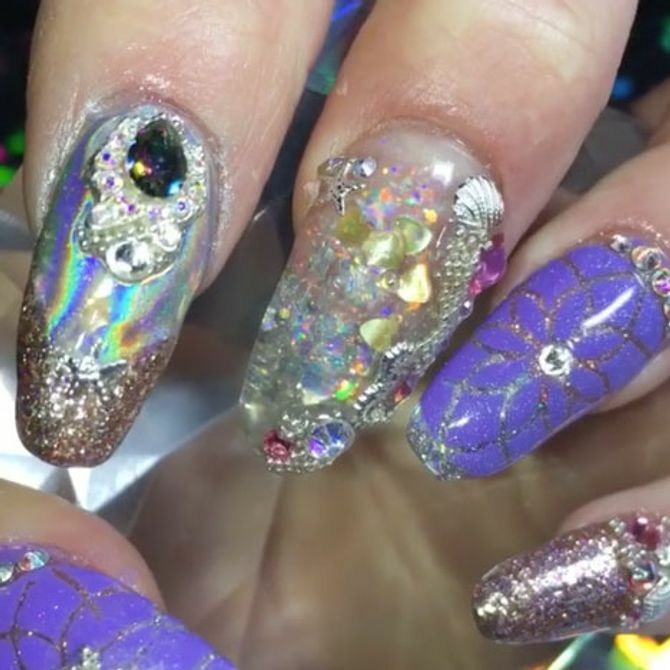 Stars, jewelled gems and ALL the glitter, meet the latest nail trend straight from the ocean you're about to become low key obsessed with, the nail art that moves. This trend is reminiscent of those snow globes you had as a kid, together with major mermaid vibes. WANT. This eccentric mani is as OTT as they come with oversized glitter clusters and pearlescent dazzlement on all ten digits. Probably not a look you'd show your keyboard but it would work for a wedding or a certain someone's birthday. One thing's for sure, you'll have to step up to the centre stage mark - this design demands all eyes on you. Not every trend is ready to wear straight off the runway which is why we love it when office-worthy hues come creeping onto the catwalk. Check out this flawless sheen manicure seen at Mulberry. Its barely-there hue makes it ideal for dealing with clients and staying profesh whilst the clean, shiny finish gives it the glamorous go-ahead. White magic is going nowhere while the long, razor-sharp stiletto talons are fading fast. Oh dear, someone had better give Rihanna the bad news.This year marks the end for lethal fingertips as short and tidy lengths dominate the runway. Finally, putting on shoes and picking up loose change doesn't require an assistant. Ditch the acrylics and polish off your tips in a fresh white hue. Hello snow queen. One of the more adventurous nail art trends was seen at Cushnie Et Ochs and involves placing horizontal metallic strips halfway across the nail. If pointed nails aren't for you then perhaps leave this one for the daring type because this look requires serious cut-throat drama. Sharp lengths and space age stripes make for a bewitching mix that only some can master. We thought larger than life talons had been and gone but now they're clawing their way back to the top. Stopping a couple of inches short of their predecessor, the new claws on the block are 100% glamorous without holding you back. Kylie Jenner would be all over this! Forget colouring up to the line and taking your polish to every edge, Cavalli was all over the unfinished style and we're sticking with Roberto on this one. Go gappy with your outlines and embrace the undone mani for a change. With the release of the 2017 remake of Stephen King's classic horror, It dominated any cinema or film-based conversations from September onwards. 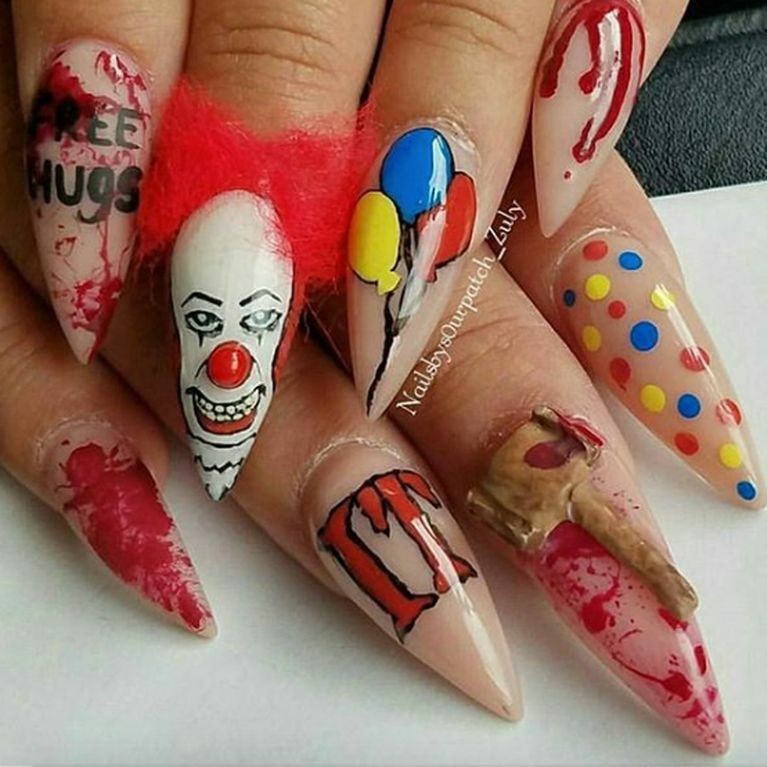 And obviously the manicurists of Instagram were inspired by Pennywise, spawning all variety of Halloween-appropriate nail art. If the sheen team's not for you, join forces with the matte models. This modern take on the ruby red manicure makes the futuristic metallics look so 2017. Top coat? Forget it! The less shine the better. Which mani has got your name written all over it? Tweet us @sofeminineUK!